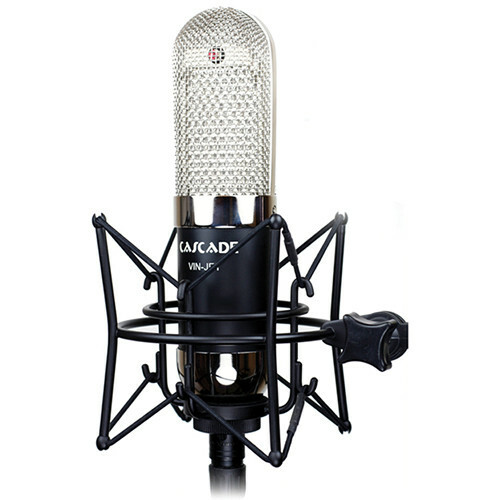 The Vin-Jet with Stock Transformer from Cascade Microphones is a long-ribbon microphone with a figure-8 polar pattern best suited for recording vocals, electric & acoustic guitars, horns, and drum overheads in studio situations. The sensitive aluminum ribbon is suspended between two powerful neodymium magnets and delivers a warm & natural sound with fast transient response, extended sweet spots, and distortion-free high-SPL handling (up to 135 dB). The phantom-power-safe Vin-Jet is equipped with an open grill (without screening added) for an open and detailed sound. It comes with a leatherette storage pouch, a mic clip, and a molded flight case. Ribbon is 99% pure aluminum, 2.5µ thick, and 2.43 x 0.18"
Box Dimensions (LxWxH) 11.8 x 10.2 x 6.2"